Recreate Recycle Repurpose Upcycle Reuse Glassware. 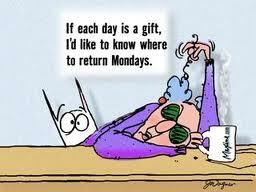 Happy Monday Everyone, and Welcome to LilacsNDreams. Hope ya'll had a wonderful weekend. Not too bad here. Did get a few things done. Have to watch my listings to see what few things will be offered next. Glassware. I enjoy working with it, I enjoy collecting, and sometimes I think I am infatuated with it too. I like many kinds of glassware too. Clear glass, pressed glass, retro glass, vintage glass, colored glass, different glass shapes, designed glass, and etc. I still enjoy collecting glassware for the home, but have also seen other things done with it, and just adore those who reuse, repurpose, and upcycle such pieces with glass. Something I have been watching a lot of, and trying to play with a bit on my own too is Glass Totems. These pieces can be made for your gardens, and are beautiful during the season when you have plenty of beautiful sunshine too. Other pieces can also be made for in the home as well. So many possibilities with each piece, and just so many ways to repurpose, upcycle, and reuse glass. It's amazing the creativity among everyone who shares. Below I will share 3 pictures I found surfing the internet to give you some ideas. I just adore how the flowers are made to either set on a metal pole, or how they can also be hung on the fence too. Of course if you can hang them on the fence you know they could also be hung inside your homes too. 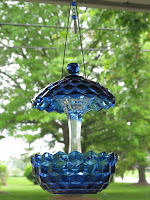 Who would have guessed that a bird feeder could be made? Very nice thought. Also, just how different glassware pieces can come together to make what you see here, or find on the internet too. RecreationsInGlass is the artisian who made this, and I found her on Etsy as well too. She has some wonderful ideas, and did some good work with her studio offerings too. 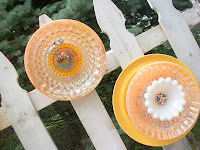 PearlsVintageGoods is yet another seller I found on Etsy who does things with glassware too. 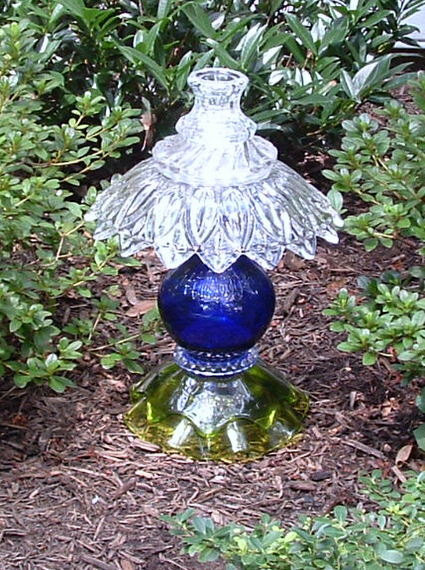 I just adore the glass flowers made by many that are set into pole stands, can hang on your fence, hang in your home, etc. This is an adorable bird feeder that was done with some blue glass, and clear glass as well. This I would really like to make myself, but don't have the tools to help me with making the holes in the glass for it to hang. Hmmm, I wonder if maybe I could just make it to also sit like on a table, or something too? Just some ideas, and of course notes I am making too. Sorry, but I find a place mentioned of where this picture came from to share with you. Hope you enjoyed what was shared with you today in regards to repurposing, and reusing glassware. Some really neat ideas that have been shared, and offered. Don't forget that there is much more out there to see, and being offered too. Bit by bit I will keep sharing with all of you, and ask you to please also share with us as well. Thanks so much for sharing your time with Me today. Always happy to see you visiting LilacsNDreams. Remember you are also welcome to share with us here as well. See you all again soon.